AI (Artificial Intelligence) in HR vs EI (Emotional Intelligence) - a new challenge? From hoverboards to driverless cars, R2D2 to robotic waiters, the world of science fiction is fast becoming a reality. 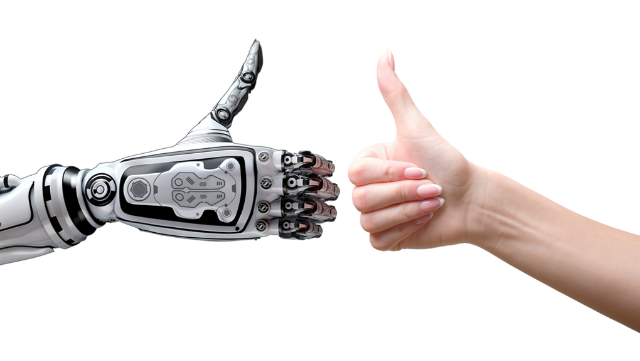 With the UK workforce at risk of being replaced at least partially by robots, what does this mean for Emotional Intelligence (EI) and Artificial Intelligence (AI) in HR? According to the BBC website, 35% of jobs in the UK are in danger of being replaced by automation and robots. Thankfully, for senior HR professionals and myself, it looks like our roles are secure for now but if you are a sales person, administrator or work in finance, there’s a higher chance of takeover. A recent joint report from Deloitte and Oxford University indicated that in Britain alone 10 million jobs could be taken over by computers and robots over the next 20 years, effectively removing one in three roles. The impact of this is likely to be greater on those earning less than £30,000 a year compared to those earning up to £100,000, and it’s certain that sectors such as manufacturing would be more susceptible to automation than others. Moreover, cities such as London may be more immune to these changes as it has fewer manufacturing jobs and a higher proportion of roles that are creative or require greater skills and knowledge than can be performed by a machine. And change is already happening. In the last decade or so jobs such as clerks, sales assistants, library workers, secretaries and travel agents have reduced by 40%. We have to accept that increasingly machines will perform tasks it was previously assumed only humans could do. If we look further overseas, the Oxford University study indicates 47% of the US labour force could be replaced by robots in 20 years’ time, while China has overtaken Japan as the world’s biggest consumer of robots with 37,000 being sold on the Chinese market in 2014. Is AI in HR a threat or something to be welcomed? There are some (including the eminent scientist, Stephen Hawkin) who compare this change to a doomsday scenario reminiscent of Sci-Fi films where the march of technology destroy us and artificial intelligence becomes more powerful than human beings, seeking to assert control over mankind. But there are others that argue this is just another major industrial revolution that could allow society to be more productive and give employees in the workplace the opportunity to really fulfil their potential and do more exciting, creative and satisfying work. If we are to believe the latter, then HR – by adopting an open and inclusive approach and attitude to automation and robots in the workplace – can influence a seismic change in employee well-being and engagement at work. But the greatest challenge will be for HR professionals not only to embrace this change themselves but deal effectively with resistance in the form of feelings of anxiety, anger or insecurity from others that such a change will inevitably ignite. So how can HR sell the benefits of AI? There is a strong argument that automation increases productivity and lowers costs. If the profits of an organisation increase due to those lower costs, then revenue and employment may subsequently grow in an automating firm according to Robert Atkinson, President of The Information Technology and Innovation Foundation who goes on to say that studies of thousands of companies in many different countries have shown that this growth happens in approximately half of businesses that experience productivity increases. The Oxford University/Deloitte Study also points to the fact that many new jobs will be created as new industries and positions spring up, along with jobs requiring the skills that machines are unable to match. Yet it also states that making sure new jobs outnumber those being eliminated requires creating a workforce able to service the high-skilled positions that technology is unlikely to take over. This has important implications for HR and its Workforce Planning Agenda, encouraging HR to look at the design of jobs and roles, especially those that require good judgment, creativity and emotional intelligence skills that cannot be replicated by an automated machine. But above all it will be the management of the artificial intelligence that will be a key development requirement for many employees. A piece in Harvard Business Review last year raised the point ”we tend to focus on what robots can do, more than how we will work with them”. We will need to work alongside robots and, if you like, computers will be seen as team-mates. But this means re-defining work and our identity at work. It requires partnership skills and joint collaboration to maximise the benefits of a highly automated enterprise and will see HR working alongside managers to get used to this new dynamic in the workplace. What’s more HR will need to access both its influencing toolbox and facilitation skills in ways that will be totally different from any used before. Tolerance, inclusion and embracing a new kind of diversity in the workplace will all take on fresh meaning as new policies, guidelines, values, behaviours and ways of working are re-defined. But it’s clear that this could be the dawn of emotional intelligence working with artificial intelligence – the two working in tandem can have devastatingly powerful consequences to benefit us all and to make our everyday working lives more exciting and enhance our economic growth. So what do HR professionals need for this ‘new world’? It goes without saying they will need to be digitally savvy and possess strong organisational design skills or re-design skills! But above all they will need a forward-looking approach that embraces automation and realises the benefits it can bring. This, combined with an abundance of adaptability, flexibility and emotional agility will enable them to guide their managers and people through these massive changes. Walt Disney once wrote: “We keep moving forward, opening new doors, and doing new things, because we are curious and curiosity keeps leading us down new paths.” So HR must programme itself with this zest for curiosity and if there is any fear of a robotics future, remember curiosity is the best way to deal with it!